Super adsorbent and super soft eye pad that is now refillable. Made from soft, velvet velour USA made organic cotton*, that has been prewashed in non-cholorinated water with no soap or dertergents, with an insert of organic cotton that has also been prewashed in non-cholorinated water with no soap or dertergent and filled with a proprietary coconut shell charcoal. Sleep more deeply, by not only blocking all annoying lights, but by detoxing your eyes while you sleep. A soft, velvet velour elastic strap, slips over the head for a gentle snug, but not tight fit, to easily wear all night long. The zipper is the opening where you can refil with a replacement charcoal insert. All eye pads come with the insert. The zipper is worn on the outside, not against your eyes. Instructions included. It can be steamed for 3 - 5 minutes in a simple vegetable steamer or may be used dry. Or, if you prefer a cold treatment, spritz with pure water and place in fridge or freezer until it is the ideal temp for you. If using for tired, computer weary or contact lens sore eyes, the inserts will last from six months to one year. If using for an eye condition, we recommend a new refill about every two months. When not using, keep in plastic pouch it came in or a tight fitting glass jar such as a mason jar so that it will not adsorb odors or chemicals in the room. 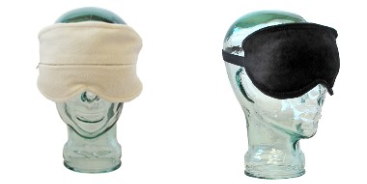 * Off White masks - organic USA made cotton velour with no dyes, this is its natural color. Important: Because charcoal has the abiltiy to draw foreign objects to the skin surface (ie. thorns, glass and bone fragments), on the SAFE side, we advise against using with any kind of lens transplants such as in cataract surgery. As always, consult your doctor if you have any serioius eye condition before using. "The more severe inflammation of the eyes will be relieved by a poultice of charcoal, put in a bag and dipped in hot or cold water as will best suit the case. This works, like a charm."